For decades, maritime trade unions have extended a heartfelt hand of solidarity to seafarers in distress in foreign ports. Too often, though, those wanting to help have been badly limited in the support they could extend — because national laws do not apply to a seafarer who is foreign, sailing on a flag-of-convenience ship registered in one country and working for an employer in yet another. How in the world can crew who haven’t been paid, or have no food, or need medical care, be helped when there are no laws or labour boards with jurisdiction to address the horrific conditions and distress they sometimes suffer — conditions that ITF inspectors confront all too often? This week, we’re taking a series of looks at a new tool that strengthens the ability of workers to stand up for their labour rights, and helps them support one another in having these rights respected and enforced: the MLC, or Maritime Labour Convention. In Canada, ITF inspectors bear routine witness to the havoc that substandard – and most often flag-of-convenience – shipping wreaks on maritime workers. We have seen it all: unpaid wages, rotting food, sick and injured workers, unsanitary and unsafe conditions. For anyone raised in a country with even minimal expectations about fair treatment for working people, the conditions are appalling enough to make us vomit. Sometimes literally. Today, we offer a quick look at a handful of the Canadian cases that illustrate why the MLC was necessary. Peter Lahay, Canada’s current ITF coordinator, describes the first case he ever handled, in the fall of 1991, as a perfect illustration of life before the MLC came into force two years ago – life for crew, and life for an inspector trying to help rectify problems aboard. As Lahay tells it, the ITF inspector serving Vancouver was away at an education conference when the crew of Zodiac Maritime’s MV Hemlock called the office of Local 400 of the International Longshore and Warehouse Union looking for help. Dave Crain, president of the local, sent Lahay down to investigate. What he found on the Hemlock was stomach-churning. Many of the crew were from Bulgaria, and explained that officers and crew were being treated very differently. The vessel was crawling with cockroaches, and when the officers dosed their messroom with bug spray, the roaches fled to the crew’s side. The officers had meat and fresh vegetables every day; the crew had very little meat and were given only the vegetables that were spoiling. Crew brought Lahay into the officers’ mess and opened a small fridge to show him the supply of bottled water; in the crew’s mess, there was no fridge and no bottled water. In fact, the last time the ship took on fresh water was in Venezuela, where it had pumped up water directly from the Orinoco River. Crew were suffering from stomach ailments and receding gums as a result contaminated water and poor diet. Finally, one crew member stepped up with tears in his eyes to say he needed medical attention but was being refused by the captain and the owners. A second crew member began to pull the man’s pants down. Lahay attempted to stop him, but the man said, “No, you must see this” and motioned for his friend to drop his pants and underwear and bend over. When he did, Lahay was horrified to see a tangle of blue, green and purple hemorrhoids some 50 centimetres long dangling from the man’s arse – the ailment for which he was refused a doctor. The ship’s agent and owners were contacted, and veiled threats of industrial action made against the ship if the problems weren’t fixed. The sick crew member was brought to a doctor, and vague assurances were offered about improving conditions after the ship sailed. But it was clear to everyone that was an unlikely possibility. The owners simply said what they needed to say and sailed their ship onward, manned by its poor and mistreated crew. Lahay – who as a young tugboat deckhand was stunned to discover such appalling working conditions existed in Canadian waters – says he has yet to forget the shock, and that he is still certain no good became of the vessel and its abused crew. Today, every one of the issues uncovered on the Hemlock could be dealt with under the MLC by an ITF inspector, with the full backing of Transport Canada staff. It no longer takes the threat of industrial action to force an owner to agree to send a man ashore to have a painful medical problem cared for, or for a freshwater tank be emptied, cleaned and filled with proper drinking water, or for food of sufficient quality and quantity to be brought aboard immediately – or for all the workers aboard a ship to be given equal meals, regardless of rank or nationality. Lahay’s story is a tough one, but it describes in accurate detail the way life looked aboard the substandard ships that clogged Canada’s ports throughout the 1990s – and why things needed to change. And they did change initially, but not enough. In 1994, Canada became a full member of the Paris MoU on Port State Control, introduced internationally to deal with the worldwide problems created by slippery owners. As Canada began to lean in to combatting the risks posed by poor-quality ships, it opened the door for Canada’s ITF inspectors to begin carefully cooperating with Transport Canada in cases where our work overlapped. In Vancouver, on the Great Lakes, on the St. Lawrence and in Atlantic Canada, ITF inspectors began taking cautious steps to cooperate with, and sometimes seek some assistance from, Transport Canada’s marine safety inspectors. But these were early days: Transport Canada still had no real means to detain or even admonish a ship when crew were not being paid. If they got a complaint on lack of food, all they would tentatively ensure was that the vessel had what looked to be sufficient stores to get to the next port. Their mandate, pre-MLC, was clearly insufficient. We should note here that Canada’s ITF inspectors have experienced a complex relationship with Transport Canada’s enforcement officers. It’s fair to say that many of them are decent Canadian workers who find the conditions aboard some ships appalling. But while we could agree on that, and wanted to work together, it was often difficult. We have always held the working understanding that Transport Canada is not just beholden to the Canadian public that it is mandated to protect; it is also enormously beholden to its stakeholders — the terminal operators, shipping agents, shipping companies and associations like the BC Chamber of Shipping and the Shipping Federation of Canada, and, of course, maritime lawyers representing owners’ interests. From the perspective of those parties, the ITF was seen as labour, and over the decades the shipping establishment had counseled TC to be suspicious of the ITF and maritime unions. But even if we had been able to work in lockstep, without real enforcement muscle from Transport Canada, ITF inspectors were on their own in the pre-MLC era – especially when dealing with unpaid wages, a common problem. A case aboard a vessel we will call the MV Argo says it all. The Argo was alongside in Vancouver to discharge copper concentrate. The ITF was contacted by crew, who had been cheated out of 40 per cent of their salary for the past seven months. When our inspector boarded the ship, it was clear the Filipino crew were scared. They were desperate for their money, but they were petrified of the company retaliating against them for reporting they’d been cheated. They were right to worry; the case would get scarier for the crew before it was over. After the claim was brought to the captain and owners, they refused to pay — which meant the inspector had to talk the crew into taking strike action. 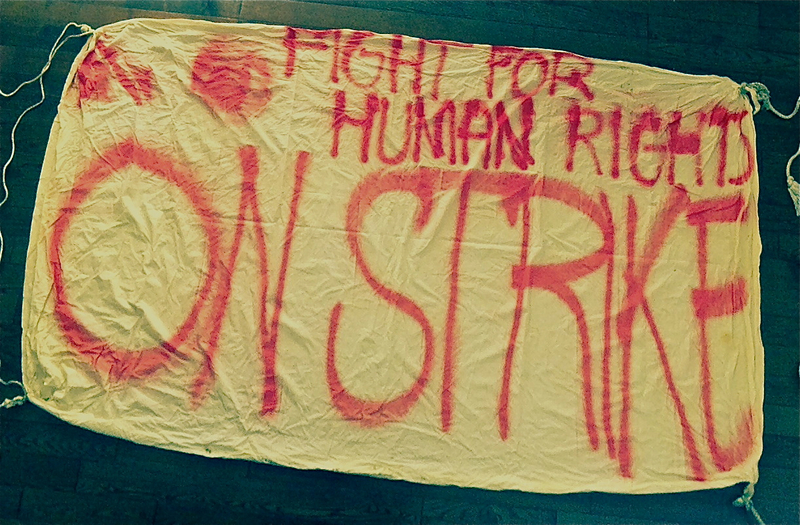 Finally, they agreed and hung out one of their bedsheets painted with large letters reading “On Strike for Wages”. With the banner up and the ship on strike, unionized dockworkers left and discharging stopped. Lawyers for the owners got involved quickly, but negotiations went painfully slow. Eventually, recognizing that crew had been cheated, the company lawyers advised owners to pay up. Story over, happy ending? Not in the crew’s minds. They had enough experience to be know that having stuck up for themselves and won their rightful wages, they would be punished after they ship sailed. They didn’t want to stay on the vessel and instead demanded to go home. Eventually, the owners relented and a new crew was flown in from Philippines. The original crew still worried; they knew the company would now demand they be blacklisted from the crewing agency — and perhaps from all Manila-based crewing agencies — for having contacted the ITF. In the end, the inspector had to threaten industrial punishment should the crew be blacklisted from the industry, the only real tool he could offer to a crew flying home and simply hoping they were still employable. In one momentary victory in the late 1990s, Jim Given, then inspector for the Great Lakes/St. Lawrence, was called out to the Atlantic region by crew who had been cheated on salaries for nearly a year. The Greek owners refused to repay crew, so Given convinced a port state control officer to detain the vessel. It was the first time a ship had ever been detained in Canada for non-payment of wages and poor onboard conditions. After being informed about the problems by Given, the TC officer detained the vessel for deficiencies and included non-payment of salary, arguing that it was contributing to low crew moral and constituted a navigational safety risk. Needless to say, about $100,000 US was wired that very day from Piraeus to Canada. It was a creative one-time solution to an ongoing problem, but not one that would be repeated again until the MLC was delivered. Sometimes, ITF inspectors will get called in on a complaint, only to discover other issues. Crew might complain that there isn’t enough food, or that it’s going bad. They might want help because they signed a nine-month contract and after 12 or 14 months, the owner still won’t let them go home. Sometimes the ITF inspector will go to the ship for one complaint, check paperwork while aboard and discover that crew did not even know they were being cheated on wages — because they were not informed the vessel is covered by a collective agreement, and that they had been asked to sign a fake contract for wages well below what they should be paid. Sadly, that is a common occurrence. To work effectively, ITF inspectors have to develop a professional approach to dealing with the mess that substandard shipping creates – but it’s pretty much impossible to become immune to the human misery we witness. It’s an odd sort of multitasking: even as we sharpen a pencil to calculate a wage claim, we imagine what it’s like to be stuck on board a ship for more than a year, overdue to see family that has been awaiting you for months, overdue to lay eyes on the baby born while you were at sea, or to attend a ceremony for parents that died while you were at work across the globe. We imagine spending 14 months on a bare, noisy, vibrating bulk carrier that serves as home and workplace for months on end, only to be told you will not get paid for work you have completed. Or being ordered up a gantry crane to untangle some wires, only to fall feet-first to the deck 10 metres below. In the autumn of 2001, Peter Lahay got a call from ILWU dockworkers about a Filipino seafarer who had been rushed to hospital after such a fall on a Panamian-flagged bulk carrier called the Westwood Jago. It was one of the cases that stuck with us, a reminder of how willing owners and insurance companies are to treat seafarers in ways they would never treat their own families. The man, who was wearing no fall-arrest or safety gear, had both feet shattered. His leg needed a metal pin, his left eye was ripped up and his head was badly hurt. He got immediate trauma care in a Vancouver hospital, but he was forced to lay there for a full 30 days before the insurance company would approve surgery to close the open wound on his leg. He lay there for a month, knowing he would still need reconstructive surgery after the wound healed, as the insurers kept insisting they were sending him back to the Philippines for further care. It was infuriating and heartbreaking at the same time. The man had two toddlers and a baby due by Christmas, and he was smart enough to fear the worst: that once they flew him home, his feet would be amputated, his working life would be over and his family would be penniless. We argued hard with the insurer and the local doctors, who tried equally hard to support him. Local people started a bedside vigil, because he was afraid they’d spirit him away in the night on a stretcher. Medical officials told him he had been ordered home within days. His wife got a call at home saying he was due back by that weekend. A reporter wrote a story about the situation, laying out a picture of medical care that didn’t look right to Canadians. One of the toughest things to read was a fear he relayed to the reporter about the prospect of a trip home for a quick, cheap amputation of both feet: “I didn’t want for them to cut my feet off, throw them in the garbage and burn them. I want to go home normal. Without my legs, I cannot work. Life for my children, it will be hell.” He had a good idea how care at home would go, and he was no stranger to injury. He’d had two bad accidents in his seven years at sea – one of them when a line let go and sliced his abdomen open. In the end, with enough arguing and publicity, the insurer agreed to have the surgery and two months of rehab done in Canada. When the seafarer finally got home, he could walk, got some more rehab and used his payout money to open a vegetable stand. Inspectors are not the only Canadians who step up when working conditions are poor. We saw the community rally for the man injured in the gantry fall. But many times it’s dockworkers who call the ITF because they see things that are wrong, like crew working outside in the middle of winter with no cold-weather clothing – sometimes with nothing but flip flops on their feet as they work outside on deck. One Burmese crew we came across on a Korean-owned ship had no heat inside. It was January; the temperature was well below freezing. The men were so cold that one fell to his knees crying as he begged for help. Upstairs in the captain’s office, we discover that it was toasty. That’s inhuman. We know it, and Canadians know it. Their outrage is helpful. In those dirty days on the docks, defending seafarers from atrocious shipowners, we were never afraid to bring in reporters from newspapers, TV or radio. Because the conditions were so sickening on so many ships, we sometimes had more media attention than we could handle. For several years, filmmakers and magazines turned their attention to our battles too. In the end, government and the industry associations had no choice but to get out of our way and to find ways to cooperate, because we were winning the hearts and minds of the public. As we wrote yesterday, even Transport Canada had by 2002 submitted a paper on substandard shipping to the Organization for Economic Cooperation and Development. In Canada and around the world, shipping was taking a huge, unavoidable beating in the public eye — and the ITF and its inspectors helped ensure that. Public concern was an enormous tool for us, because that and the threat of industrial action were all we had. Still, neither of these — nor anything else the ITF could do – was going to change the reprehensible behavior of shipowners. Yesterday, we provided some background on how we got the MLC convention enacted, and about what a difficult road we travelled to achieve an enforceable convention that must now be applied vigorously to seafarers’ employment and conditions. No one expects the next leg of our journey to be easy. Or that the MLC is ever going to fully reform an ultra-competitive shipping industry. In Canada, Transport Canada is the government agency charged with enforcement of the MLC. No one should think that port state control inspectors and transport authorities will, on their own, clean up the industry either. They are not experts on maritime labour. We are. But they are required to inspect for obvious employment-condition deficiencies and to take and act on complaints from crew or anyone else with an interest in the safety and well-being of crew — including seafarers’ labour representatives like us. They should also seek expert help on employment matters, and ITF inspectors are well placed to provide the solutions. We’ve detailed a number of troubling examples about how life looked in the days before the MLC was put in place. It might be useful now to have a look at what those cases would look like under an enforceable MLC in Canada. On the wage claims: The MLC requires that crew are paid all wages monthly, that crew have in hand a copy of their Seafarers Employment Agreement (SEA), that the terms and conditions must be filled in properly, that the crew has properly agreed to them and that if any collective agreement is in place, the SEA reflect such terms and conditions. Any wages that are late or do not accurately reflect the correct remuneration for hours worked must be immediately corrected or the ship will be detained. In the matter of medical care on board ship and ashore: There must be adequate measures on board for the protection of health and provision of medical attention. Seafarers needing immediate care must be given access to medical facilities ashore. The health protection and medical care must be comparable to those of workers ashore, and all medical care must be provided at no cost to the seafarer. So in the case of the worker who fell from the crane, we would have had no debate. His care would have included the reconstructive surgery to his feet that any Canadian worker would have received. In the matter of the man and his hemorrhoids, these would have been treated weeks earlier and he would not have to go through the pain and humiliation he suffered. Many cases that are allowed to go undiagnosed often get much worse. We tried to assist one man who suffered a kidney infection that was left untreated. He was extremely ill and the owners would not let him go to a doctor, even though they were often in port. He nearly died of the infection and in the end, he suffered total kidney failure and needed new one. Completely unnecessary. On shipboard living conditions: This chapter of the convention deals with everything from heat, ventilation and air conditioning if trading in temperate climates, to lighting, cleanliness, toilets that flush, showers and sinks the work, including hot water. It mandates fresh drinking water and a clean galley, ensures that onboard food and drinking water are of appropriate quality, nutritional value and quantity that adequately covers the requirements of the ship and takes into account the differing cultural and religious backgrounds, free of charge. On crewing agencies and blacklisting: Often seafarers are required to pay the agency a fee to be deployed. This is not allowable. The convention requires that no fees or other charges are made for recruitment or placement. It ensures seafarers are informed of their rights and can examine the employment agreements before and after they are signed, and ensures terms of any collective agreement in force aboard is reflected in the employment agreement, and that the agency is registered by the government and subscribes to all of the laws of natural justice and national laws. In short, this convention does provide a fairly muscular means to assist seafarers. Shipowners are aware that their vessels can be detained by the world’s port state control officers under its provisions — and many have in fact been detained. We will look at that later this week. As we said in our opening post, we don’t expect this convention will cause a lot of converts among owners who operate substandard ships, who chose money over respect for their workers. What it will do is give us a fighting chance to defend these workers’ rights as they sail the globe, to and from Canada, ferrying the world’s trade and prosperity in the holds of their ships. It is our job to defend them. It is the right thing to do for fellow workers. For Canadian inspectors, it feels right to have a tool that will help in some small way to continue the work.